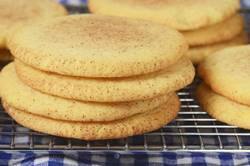 Snickerdoodles are also called Snipdoodles or Cinnamon Sugar Cookies. Recipes for this cookie started to appear in the late 1800s, and most agree they probably originated in New England and are of either German or Dutch descent. This crinkly topped cookie with its coating of cinnamon sugar is often overlooked. Maybe it is because they are more plain looking than today's creations or maybe it is because they do not use exotic ingredients. But what these old fashioned Snickerdoodles do have is great flavor. While using the most basic of ingredients; butter, sugar, eggs, flour, and ground cinnamon, when you bite into one you will find the edges are wonderfully crisp yet inside the texture is wonderfully soft and chewy with a buttery sweet flavor. These Snickerdoodles are leavened using a combination of cream of tartar and baking soda. The cream of tartar gives the cookie a slightly tangy flavor which I like as it offsets the cookie's sweetness. However, if you don't want the slight tanginess, or you cannot find cream of tartar, you can substitute the cream of tartar and baking soda with 2 teaspoons (8 grams) of baking powder. I like to make these cookies bakery size. By that I mean quite large. But if you prefer you can roll the batter into one inch (2.5 cm) balls instead of the two inch (5 cm) balls that are called for in the recipe. The important thing is not to over bake these cookies. These cookies should be baked only until the edges just begin to brown, yet the centers are still quite soft. This will keep the outside crisp, with a soft and chewy interior. Baking them longer will make them more crisp and not as soft inside. They store very well so they make an ideal cookie for holiday gift giving. Snickerdoodles: Preheat your oven to 400 degrees F (200 degrees C) and place the oven rack in the center of the oven. Line two baking sheets with parchment paper. Cinnamon Sugar Coating: In a shallow bowl mix the sugar with the cinnamon. Snickerdoodles: In a large bowl whisk the flour with the baking soda, cream of tartar, and salt. In the bowl of your electric stand mixer, fitted with the paddle attachment (or with a hand mixer), beat the butter until smooth. Add the sugar and beat until combined. Add the eggs, one at a time, beating well after each addition. Scrape down the sides and bottom of your bowl as needed. Beat in the vanilla extract. Add the flour mixture and beat until incorporated. If the dough is really soft, cover and refrigerate until firm (about one hour). To form each cookie into a 2 inch (5 cm) round ball, use 40 grams of dough. Then roll the balls of dough in the cinnamon sugar and place on the prepared baking sheet, spacing about 3 inches (7.5 cm) apart. Then, using the bottom of a glass, gently flatten each cookie into a 3 inch (7.5 cm) round. Bake the cookies for about 7 - 9 minutes, or until they are just firm around the edges, but the centers of the cookies will still be soft. Remove from oven and place on a wire rack to cool. Can store in an airtight container, at room temperature, for about two weeks or they can be frozen.